9:00 a.m. at Warrior Mountains Trading Company, 11312 Hwy. 33, Moulton, Alabama in the community of Wren. Sign up at janice@wildsouth.org or 256-974-6166. Advance sign-up is required. If it makes sense for you to meet the group somewhere in the Bankhead instead of coming to the Warrior Mountains Trading Company in Wren, please let us know. 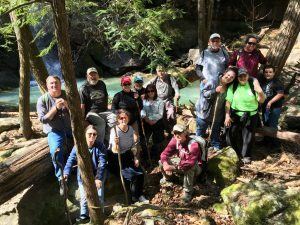 The hike to Collier Creek will begin in near the community of Grayson in the central part of the Bankhead National Forest. There are no trails on this hike and the terrain is rugged with slippery rocks. There is little to no elevation change and much of the hike will be in the Collier Creek canyon along the creek. Bring a backpack with lunch, snacks, drinking water. You’ll want your camera! A walking stick may help with creek crossings and uneven, rugged terrain. Be prepared for slick rocks and multiple creek crossings by making sure shoes are sturdy with grippy soles. Wool socks are recommended. A dry pair of socks stashed in your backpack for the hike out may be a good idea if wool socks are not available. After signing up, meet at the Warrior Mountains Trading Company at 11312 AL Hwy. 33, Moulton, AL at 9:00 a.m. Park on the south end of the building and come into the store. Meet your leader at the tables toward the back of the store at 9:00.